This is one of the categories of this blog that I love! If you find a steal or deal (please don’t steal and confess on my blog) please write to me and share! 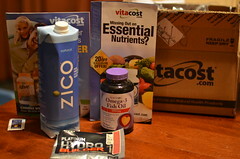 www.vitacost.com is a great website for vitamins, supplements, organic and all natural products, teas, etc. You can search based on all different criteria and the prices are very reasonable. Check out their clearance items for an even bigger deal! I get coconut oil, teas, eco/people-friendly laundry detergent, agave syrup, and multivitamins from vitacost. They have a convenient auto ship option too, so you never have to run out of a regular product you like to use! Please feel free to leave any feedback on your experiences with Vita Cost! This entry was posted in Deals and Steals and tagged Coconut oil, Laundry detergent, Vitacost. Bookmark the permalink. I've got a remedy for that! What my family and friends are doing!